RunningSpace - Running to Beat Suicide: Hurdles - what hurdles? 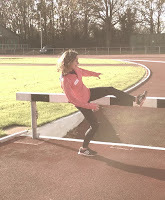 This is not the ‘best’ photo of me at the Leadership in Running Fitness (LiRF) course I went to in Bromley yesterday. But it reminded me that a couple of years ago someone who's opinion I respected told me that I was the type of person who could, did, and would leap over life’s hurdles, even those where other people would chicken out. And yesterday, I went over one. Well, quite a few actually, but now I’m a qualified Run Leader. Get me!!!! Just to say, the course was amazing. There was lots of cross-over with my teaching qualification actually, lots of grounding in practical exercises, and plenty of access to resources to develop your own sessions. Any runners out there who want to join me in this thing, get yourself on that course (it’s just a day). Can I just point out that I’m not really much of a masochist, I would often prefer to be in a hot bath or back home in the comfort of my jammies, just like everyone else. If I hide long enough, maybe it will go away. Can you relate? Someday I’ll work out why it’s so much more fulfilling to get out there and jump the hurdle. In the mean time I can just assure you that it feels sooooooo good when you’ve done it. Now I’m pretty sure I’ve got some hum-dingers lined up in front of me in the next year or two, and I’ll be relying on my friends and family and mostly my God to help me get me over them. But I promise you that one way or another, I will get over them. What about you? What are your hurdles? I'll be starting up a local running group shortly, more detail later, but feel free to facebook me for info. You may be thinking yes I’d really like to see what the heck Jacky is on about, why running rocks, why it's so good for mental and physical health. But…. I thought every single one of those things yesterday. I did yesterday's course so that I can show you that you can do it too. Need help? I can give you help. Need someone to believe in you? I believe in you. Need someone just to show you how to get there? I can do that! Please, come and run with me.